It’s no secret that textbook costs have escalated out of control. With new editions going for hundreds of dollars, outrageous prices have led to sub-economies in education focused on used textbook sales, textbook rentals, and even textbook piracy. For the most part, that only impacts post-secondary students who are responsible for their own books. But public school districts feel the pinch too. With hundreds of students in primary and secondary schools, textbooks have become an enormous expense — especially for cash-strapped districts. To make matters worse, information in textbooks advances at such a rapid pace that most books are actually out of date by the time they’re printed. Overall, that means students and schools shell out for unreliable learning resources. So just how bad have textbook prices gotten? 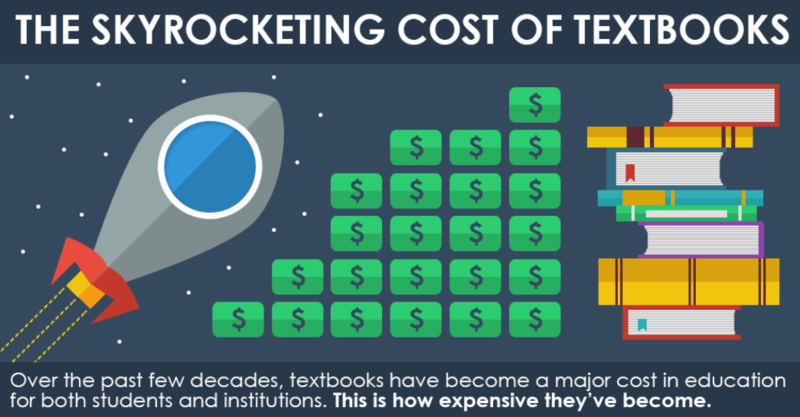 Infographic: How Much Do Textbooks Cost Today? 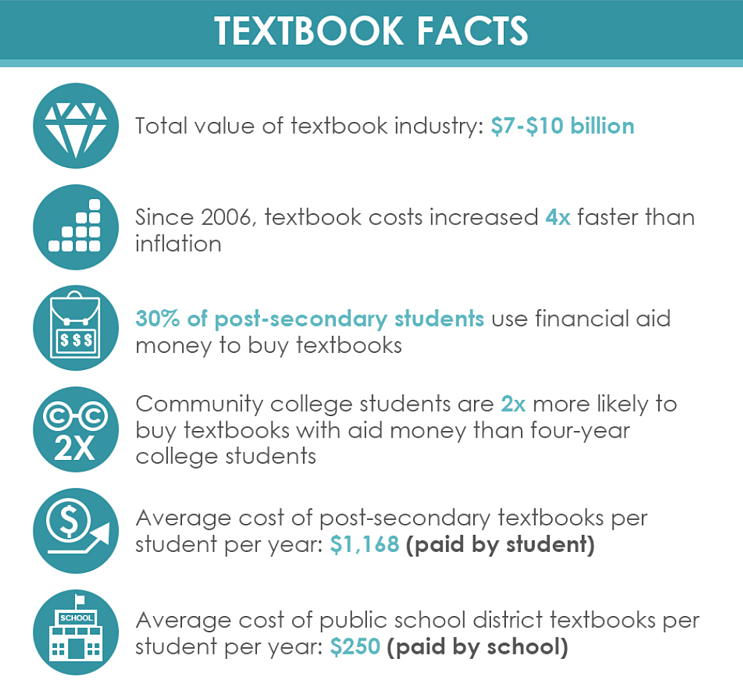 This infographic breaks down the facts on the increasing prices of textbooks. Let’s take a closer look at each of these stats. First, let’s look at some general stats. Today, the textbook industry is estimated to be worth anywhere between $7 and $10 billion. For reference, that’s roughly the same as the GDP of Bhutan ($6.4 billion) or Montenegro ($10.6 billion). That’s an incredible market share, fueled almost entirely by academia’s need to serve a growing base of students. But the textbook industry’s worth doesn’t explain why their products cost so much. In fact, textbook prices have increased 4x faster than inflation since 2006. The costs have gotten so extreme — especially for individual buyers — that 30% of post-secondary students say they use financial aid money to buy textbooks. This issue isn’t isolated to four-year universities either. It actually gets worse for two-year students. Community college students are twice as likely to buy textbooks with aid money than four-year students. So why should you care that textbooks are getting more expensive? To answer that, let’s look at the numbers behind how much textbooks have increased. 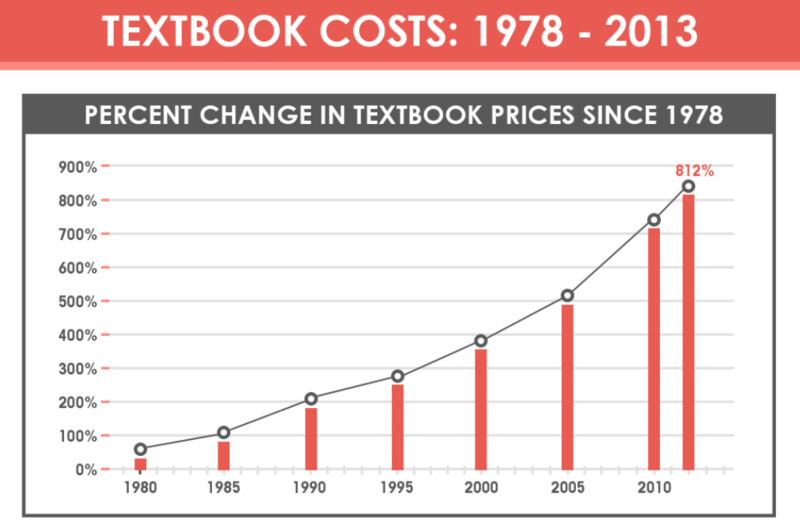 Textbook costs have increased by 812% from 1978 to 2013. This meteoric rise in costs has passed to individual students and school districts. This is especially true for post-secondary classes where professors have created textbooks and force students to purchase them for single classes. It’s also important to note for public primary and secondary education. Since they’re funded through tax dollars, textbooks have become a major public expense for every grade level. This problem gets significantly worse for low-income school districts because standardized tests are based on many of these private-label textbooks. In those terms, textbook costs aren’t just quantifiable in terms of money — there’s a very real, very powerful impact on students’ futures. Statistically, this impact far outpaces other common expenses in the United States. We’ve already established that textbooks have increased by 812% from 1978 to 2013. In that same timeframe, other industries have spiked their pricing as well. But not nearly to the extent of textbooks. While medical services and new home costs are generally more expensive than textbooks, their price increase has stayed closer to the consumer price index increase. That means — in theory — the typical American is readier to afford a new home and medical services than textbooks. Because those prices have stayed closer to being consistent with the average American income. Clearly, there are exceptions to that statement. Medical emergencies, personal income changes, and other factors go into the affordability of medicine and housing. But in terms of percentage increase, textbooks are the expense in this list that Americans are least equipped to afford. So textbook pricing is outrageous. But in the United States, there are dozens of companies that work in education. How many of them create textbooks? 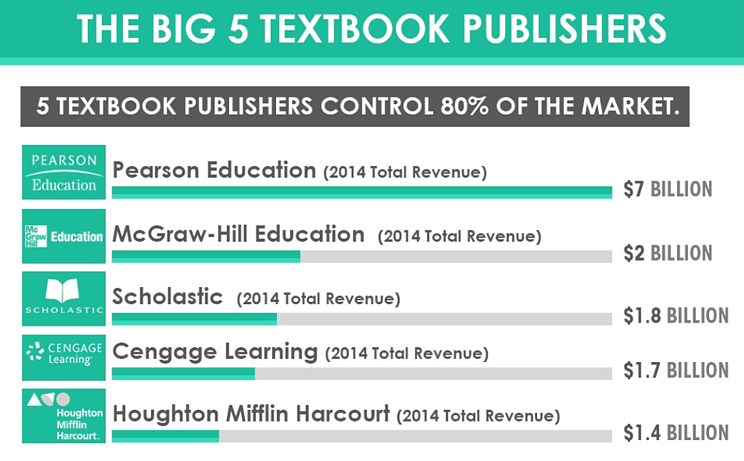 3. Who Are the Big 5 Textbook Publishers? While there may be lots of companies that create textbooks, only five companies control 80% of the textbook market. These companies have the name recognition and longstanding reputations for quality that enables them to sell at high prices and gobble up small-time competitors. Clearly, Pearson is the biggest. But the others are pretty on-par with one another in terms of revenue. So why do those four companies make almost the same amount of money in a year? The obvious answer is competition. These are all different companies creating different products for the same audience. They each have a strong reputation and a loyal customer base. That’s a great equation for healthy, long-term economics. The less obvious answer is that textbook sales operate on a captive market on many levels — especially post-secondary education. In post-secondary, students are forced to buy textbooks when their instructors adopt them. So textbook companies don’t have to please their end user to make money — they just need a good relationship with the instructor or institution. Then, the cost gets pushed to the students. This means there’s no real change in the demand for textbooks since the textbook adopters aren’t the end users. Instead, textbook companies can use a cartel-like pricing system that keeps costs high without the threat of losing their customer base. If students could choose their own textbooks for each class, then this issue would be different. Textbook companies would have to start competing in earnest to get the business of individual students instead of getting hundreds of new buyers through one instructor or institution. Inevitably, that would drive prices down to something more affordable for post-secondary students. This concept is close to how public school districts adopt textbooks. Because the district is footing the bill (instead of the student), textbook suppliers have an incentive to lower prices and sweeten deals for their customers. That’s why the annual, per-student cost of textbooks for school districts is only 25% of the annual cost of textbooks for post-secondary students. Still, school districts often contain more than 1000 students. That’s $250,000 for a year’s worth of textbooks — many of which will quickly become outdated. This makes the business model of school district textbook adoption much more stable than individual student purchases in post-secondary. But that doesn’t change the fact that textbooks are expensive — sometimes too expensive for school districts and students. Wealthier school districts can respond by playing the field and negotiating before adopting a textbook. So what can individual students do? 4. How Do Students Get Textbooks? Textbook prices have led many students to find alternatives to buying every year or semester. 67% of students choose to buy used textbooks instead of buying them new. This is the most popular decision for students because it lets them get the book they need without paying sticker price. You’ll find this economic model in lots of other industries too, like used cars and thrift stores. However, 66% of students just didn’t buy a textbook. This stat perfectly illustrates the effects of textbook pricing. Not only are they expensive, but students are willing to go without them in a class. Considering the incredible cost of post-secondary education, this could mean students can’t afford both tuition and textbooks. It could also mean students don’t find textbooks valuable to pass a class. Even beyond that, it could mean students are relying on other resources, textbook sharing, or even piracy to get through their studies. This is further supported by the fact that 55% of students say they’ve rented textbooks. Renting is a newer solution to the problem of rising textbook costs. But it’s proven to be incredibly popular, especially compared to our next stat. Only 25% of students say they’ve bought a textbook new. So while two out of every three students buy used textbooks or don’t buy a textbook at all, only one in four actually buys a new book. 25% of students also say they’ve downloaded a textbook. Whether they paid for the book or found it online for free isn’t clear. Unfortunately, there’s no data on how many students share or pirate textbooks. But given the popularity of affordable ways to get textbooks, we wouldn’t be surprised if those numbers were pretty high. So we’ve established that textbooks cost a lot for both students and school districts. 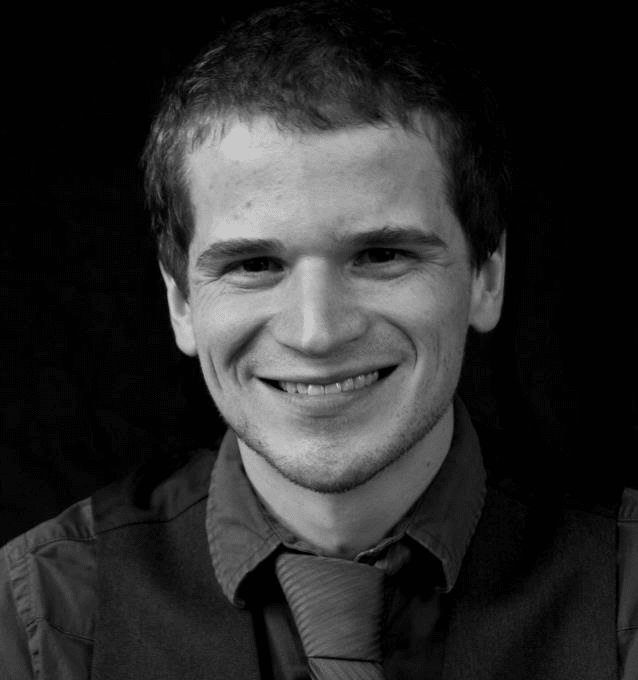 What can teachers and schools use as an alternative? 5. 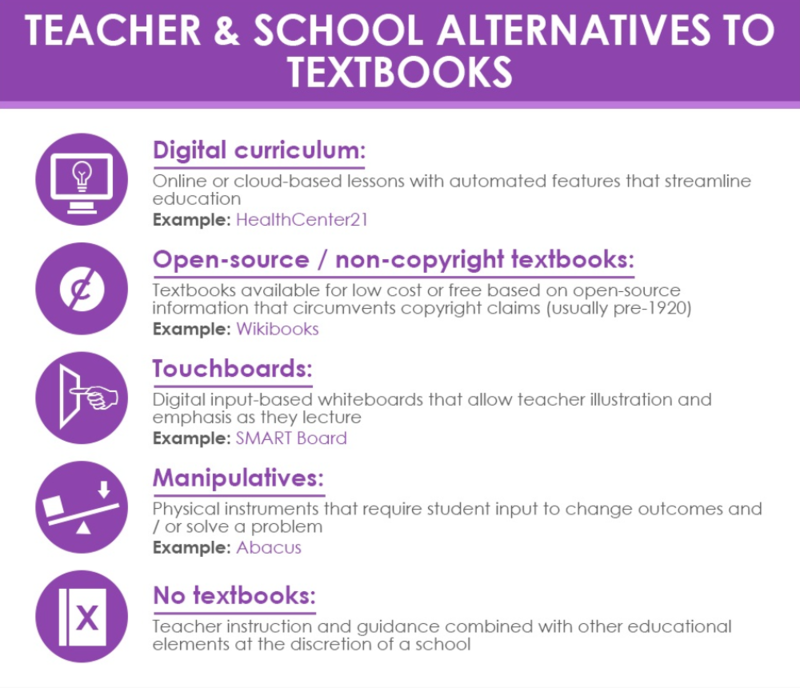 What Can Teachers & Schools Use Besides Textbooks? Textbooks may be expensive, but today’s education industry has a number of smart alternatives. The first alternative to textbooks is a digital curriculum. A digital curriculum is an online or cloud-based system that lets teachers teach, grade, and test all from one platform. Teachers and students typically get login credentials to use the curriculum and work through it at the teacher’s discretion. A digital curriculum is especially useful in blended learning scenarios, which are proven to engage students better than traditional teaching methods. Plus, digital curriculum suppliers can often update or rework information so your students never fall behind. This can save a ton of money if your school spends on new textbooks every year. Instead of shelling out for new editions, your teaching resources are updated automatically. With more iPads, computers, and smartphones in classrooms already, the digital curriculum seems to be the wave of the future. It may not have as many adopters as textbooks for now — but it’ll be exciting to watch adoption over the next few years. The second alternative to textbooks is non-copyrighted materials. This means information that circumvents copyright claims. It’s a great way to get information at no cost. However, most of the information was created before 1920. That means any math, science, or 20th Century history is outdated by about 100 years. A third alternative to textbooks is touchboards. These interactive whiteboards let teachers lecture with fun, engaging media. Whether a teacher is speaking straight from a book or adding their own flair to a lesson, touchboards can make a huge difference in a classroom. A fourth (and surprising) alternative to textbooks is manipulatives. These are traditional learning tools that let students input information and change outcomes based on a problem. The best example of this is an abacus. While manipulatives aren’t popular in the United States, they’re used frequently throughout the rest of the world. The final alternative to textbooks is no textbooks at all. This isn’t recommended for students or schools. But as you’ve seen from our stats, it happens. Sometimes, you really just can’t afford a textbook. It’s no secret that we prefer digital curriculum to textbooks. After all, we created HealthCenter21 and Business&ITCenter21 expressly for that reason. Teachers can use either of our products in conjunction with textbooks. But after picking a program, they often choose to save money by not spending on texts. Each digital curriculum we offer comes with tools teachers can use to improve the student experience and make their own lives easier. Automatic grading, course creation, custom exams — they’re all contained in a digital curriculum. In a nutshell, teachers get more while saving time and money. To us, that’s a lot better than just buying a book. Want to give a digital curriculum a shot? Check out our programs to find one that works for you!